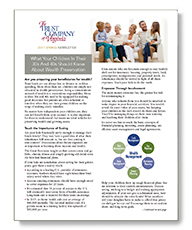 Are you preparing your beneficiaries for wealth? Trust funds are not always lost to divorce or reckless spending. More often than not, children are simply not educated in wealth preservation. Being a conscientious steward of wealth is a tremendous responsibility. Heirs in their 30s and 40s need to be equipped for making good decisions, but parents are often reluctant to interfere when they see their grown children on the verge of making costly mistakes….